There are fans of The Castle out there, right? I only ask because it felt so contained within my family as a kid. Only in my cousins’ living room would I spy the familiar VHS cover, with that daggy photo of the daggy Kerrigan family beaming out, and even now, it’s only at family gatherings that I hear gleeful quotings and recommendations. It’s never entered conversation with friends, I’ve never heard breaths of it at the pub, and I don’t even see #TheCastle trending on Twitter, where the most fervent film criticism unfolds. I know it’s just a chance outcome that I’ve met no non-Barlows as avid about the movie, but it still feels so on the nose of our clan’s general outlook that there’s something appropriate about it refusing to be shared with anyone else. Well, I know for a fact now that there are fans elsewhere, somewhere. A 2010 poll by the Australia Day Council of New South Wales had the lead character, dopey and loveable dad Daryl Kerrigan (Michael Caton), rated as the most Australia-representative character in cinema, ahead of Mick ‘Crocodile’ Dundee and Muriel Heslop. And regardless of the backgrounds of the 1003 voters, you’d be hard pressed to find a better role model than the Kerrigan patriarch: amateur home-builder, professional bloody legend, and the one who rolls up his sleeves to save the family home from corporate acquisition. An Aussie battler too, some would understandably claim. The same article quotes a scene where Daryl comes undone in the People’s Court for not having legal basis to challenge the airline taking his property. “The law of bloody common sense!” he shouts, for lack of a better argument, and for many to echo in years to come. The same happens in his first meeting with a legal representative, when he tells her with forthright tone to stop pretending that she’s on his side. These are funny, punchy scenes that show Daryl’s frustration and fortitude, as society paints over its individuals with laws that significantly benefit its most conniving and wealthy. 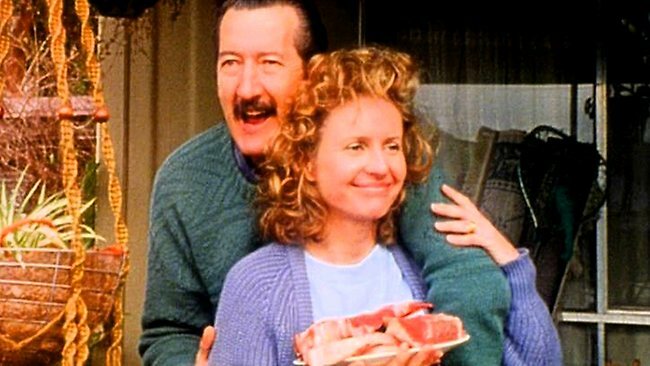 The real key to the movie, and the thing that the Working Dog crew really respect about their protagonist, is his friendship with Laurie (Charles “Bud” Tingwell), a man who represents all of the upper-class ambition that the Kerrigans have little to no conception of. This is a person that Daryl could easily write off, and shelve into the same corporate bureacracy that impedes him from the word “go”, starting with the power lines yawning across his back yard. How truly heroic, then, that he refuses to let that happen, striking up a conversation where he compares his daughter Tracey’s (Sophie Lee) TAFE certificate in hairdressing to the elite qualifications of Laurie’s son. He’s oblivious to the actual standards at play, but he couldn’t be happier or nobler in his attempt to build bridges, and it’s something that puts a highly moral man like Laurie in admiration, as well as the audience. Without spoiling anything, this is what compels him to help the Kerrigans in kind, and take the film right to its resolution. For this reason, I don’t quite understand those who think the film is demeaning to the Australian working class. True, the narration by Stephen Curry as Dale gets laughs from his dim intelligence, but that’s character-driven humour that’s balanced out by his unending curiosity in the people around him. Taking the best lessons from his father, he doesn’t for a moment judge anyone by their appearances, not even narrating when slimier characters come knocking at their door. Similarly endearing behaviours are found in the other family members, whether it’s the homespun wisdom and cookery provided by Sal (Anne Tenney), the inventive contraptions and trade bargains realised by Steve (Anthony Simcoe), or the opportunistic tertiary education and worldly travels had by Tracey. “Looks like everyone’s kicked a goal!” says Daryl, and his satisfaction in saying so is palpable. This sense of positive embracement is all over the film. The most obvious example is Daryl’s incredible show at his daughter’s wedding, and the completely nonchalant acceptance of her loquacious husband Con (Eric Bana) into their lives. Farouk, a neighbour from Beirut played by Costas Kilias, talks blithely about blowing up a thug’s car, which might inspire a panicked call to ASIO in some but only inspires genuine laughter in Daryl. There’s Wayne (Wayne Hope), the black-sheep son behind bars who’s poignantly portrayed and never not accounted for when contingencies are being made by the family. And then there’s the dead-beat lawyer, Dennis Denuto (Tiriel Mora); an absolute drop-kick if ever there was one, and yet one that Daryl stubbornly refuses to let loose, giving him pep talks all the way up to the Supreme Court. He lost the case against imprisoning Wayne, and yet Daryl‘s the one begging the other to stay? It’d be unbelievable if it weren’t so hysterical. Most impressive of all is when Daryl invokes the indigenous owners of Australian land as an analogy for his own situation. The film handles this with total maturity, acknowledging the inherent ridiculousness of the comparison (“You been drinking? !” says Sal in immediate response) while leveraging it into a positive determination for the future. The film’s not seriously equating the Aboriginal territories with Highview Crescent or Bonnie Doon, but it knows that a story about Australian sovereignty is remiss without acknowledging that raw part of our national history where intruders claim and violate what isn’t there’s, and it does so with amusing grace and acceptance. You can argue that Daryl’s battling spirit was what got them to the court to meet Laurie to begin with, but if the aim is to best appreciate the film, than focussing on that aspect of him misses the forest for the trees. It’s his openness to people of all classes and cultures – not a trait historically bonded to the Aussie larrikin identity, truth be told – that aids him most on his quest and imbues the whole film with its warm glow. It remains a very enjoyable movie that deserves as much love throughout the country as it does around my parents’ Sunday dinner table. And if someone says otherwise… well, you’ll know what to tell ’em.